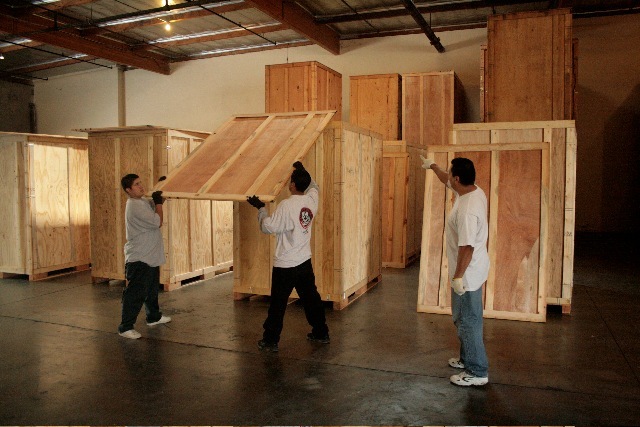 At Goodman Packing & Shipping, we offer full service crating for your goods. We've been crating and packing for over 25 years and know how to crate valuable, delicate and hard to pack items. We offer a full range of professional packing methods, and a wide rage of packing materials, including solid plank styrofoam, corrugated boxing, metal/plastic strapping, and palletizing. If needed, we will arrange for onsite packaging and crating. We will design and custom build all wood or combination wood and cardboard crates based on shape, weight, size and value of the goods. We can build you a museum quality crate or build you a more economical one-time crate. Many times we can even suggest alternatives to wood crating while still providing you with guaranteed protection. • Transportation companies who know all roads and handlers, are not created equal! The Goodman shipping network has partners in New York, San Francisco, Denver, Boston, Chicago, Houston, Atlanta, Miami, Washington DC and International partners in London, Paris, Toronto plus affiliates around the world who offer the same kind of quality services and low rates and can get your items from there to here, or anywhere in the world. Safely, quickly and for a low price. Feel free to email us, give us a call toll free at 855 BOX BROS, or simply fill out a form here for a free quote. Goodman Packing & Shipping is a leader in the specialty export freight industry, providing expert packing, crating, and worldwide shipping services to businesses and residential clients in every state in the United States and abroad. We will pick-up, insure, pack, crate, ship, and deliver with one simple call! If it is a big item or difficult to move, we do free on site estimates upon request. We're a local company with a global reach.